Everyone knows that we live in a "skin-is-in" society, heavily driven by media and immodesty. So how does a young Christian woman reconcile a fashionable wardrobe with maintaining her integrity? 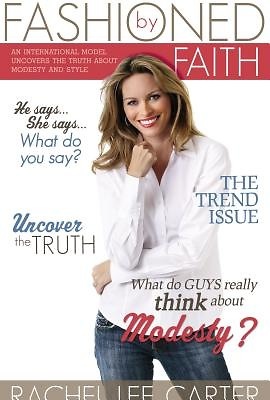 Written by international professional model Rachel Lee Carter, Fashioned by Faith offers a cutting-edge approach to the concept of beauty with a Biblical foundation that will attract moms and daughters alike. Readers will love hearing about Carter's exciting story as she leads them on an engaging study that touches on a huge felt need for young women: real beauty has nothing to do with looks. Offering three valuable perspectives--teen boys, a professional model, and God's Word--Carter explains her standards of modesty in a way that will make readers acquire a specific understanding of the author's wardrobe choices and the impact those choices can make on others. Readers will also learn to season their self-image with daily quiet time with God. A tour of Scripture will reveal the value of heart issues like modesty and why they're important to God.